I've recently become engaged, which means I drive my fiance crazy every time I see a jewelry store. However, I've noticed that diamonds seem to be just about the only choice in wedding or engagement rings. I've also noticed that they all look the same, just in different sizes. Who wants a cookie cutter ring? Always a person who wants to go against what everyone else is doing, I've decided I want to be different. I want a ring no one else is going to have. I want a ring that symbolizes the love and commitment between my fiance and me. 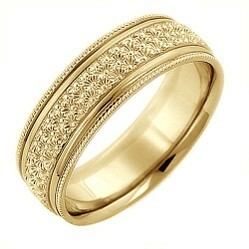 One style of ring that has been catching my eye lately is the wedding band with no stones. I've never been an avid wearer of jewelry, particularly rings. When I wear a ring, I usually end up catching it on my clothes, someone else's clothes, or scratching various objects. The raised stones just get in my way. With an engraved wedding ring, that won't be an issue for me or anyone else who has the same problem I do. Plus, I think these are much more beautiful than rings with stones. The engravings make them so unique, I'm quite sure I'll not run into anyone who is wearing a ring like mine. The carvings on this 18K gold ring are exquisite. It's so much more elegant than a plain gold band. This ring features a comfort band, which will give you a much more comfortable fit through the years. Available in sizes 3-16. Engraving is free upon request. This vintage style Art Deco ring is perfect for someone who wants something totally unique. It's also perfect for someone who isn't used to rings (like me) and needs something small and discreet. 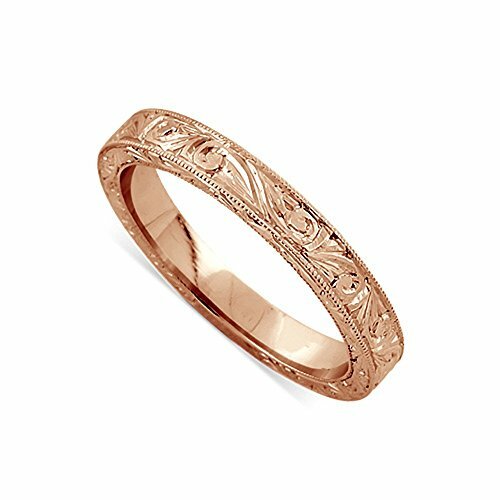 Hand carved and made from 14K pink, yellow, or white gold, it's sure to become a family heirloom. Note: Be sure to order your correct ring size. This ring is not resizeable. 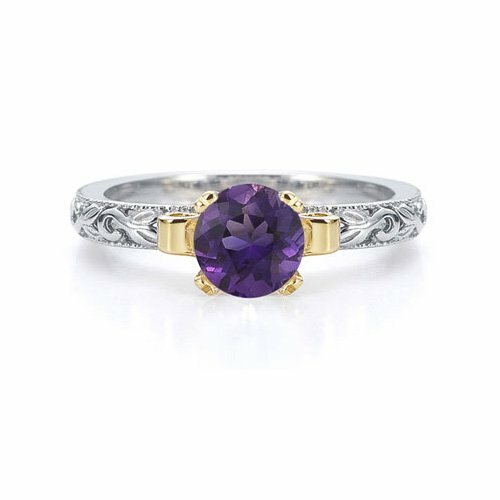 These beautiful amethyst rings are a perfect alternative to traditional diamond rings. In fact, I think they make a ring look so much more regal. The color purple has long represented royalty and wealth. This stunning ring made from two tone 14K gold is made in the Art Deco style. 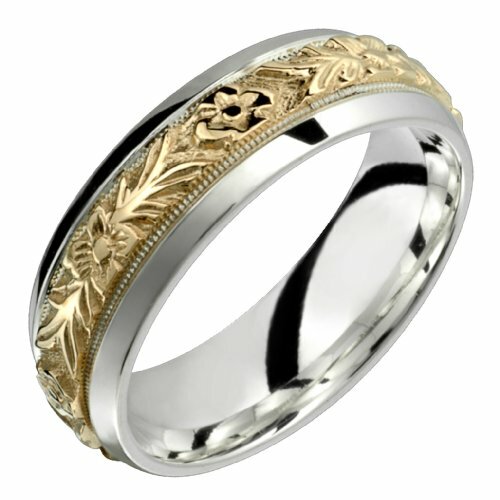 For brides planning a Great Gatsby or Art Deco themed ceremony, this wedding ring will fit in beautifully. At one carat, this ring is far cheaper than buying a diamond ring of the same size, but far more eye catching and unique. If you're like me and prefer a low profile ring instead of a ring with raised stones, this lovely wedding band to the right is a perfect choice. The unique antique design of this ring will eliminate any snagging or catching by the stones on fabrics or other objects. This simple wedding band is available in your choice of .18 carat palladium. Sizes 3 through 10 are offered. There is not a better stone to symbolize the union of two people in marriage. Sapphires have long represented truth, sincerity, faithfulness, and constancy. Sapphire rings are also durable and not prone to scratches. On the hardness scale, they're nearly equal to diamonds. From Napoleon and Josephine, to Prince William and Princess Kate, sapphires have been the engagement or wedding ring of choice by royalty. 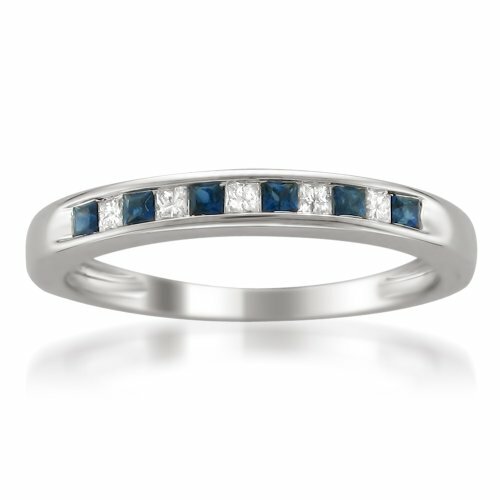 I am very partial to blue sapphires, probably because they're my birthstone. But, really, who can resist that deep vibrant blue? Sure, diamonds sparkle, but sapphires radiate. 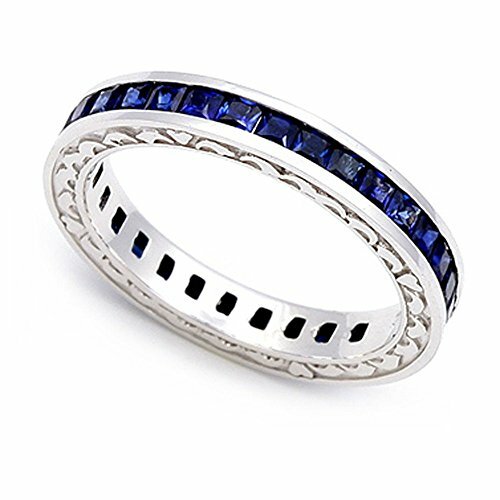 Sapphire wedding bands are the perfect choice for a bride who is looking for a beautiful and unique alternative to the standard diamond wedding ring. The first elegant wedding band is made in your choice of 14K white gold. With a combination of both sapphires and diamonds, this ring is truly unique. Available in sizes 4.5 to 9. 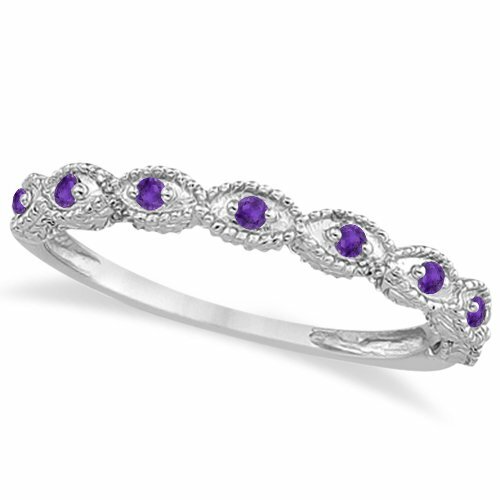 The sapphire eternity band is made from 18K white gold and is engraved with hearts on the side. This wedding ring has 32 stones that are channel set in the band, perfect for preventing snagging. 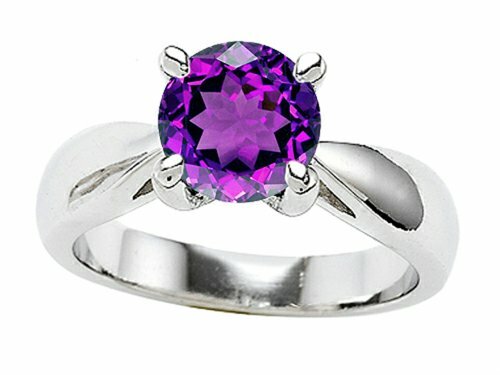 Channel set stones are great for those of us who are ring challenged. 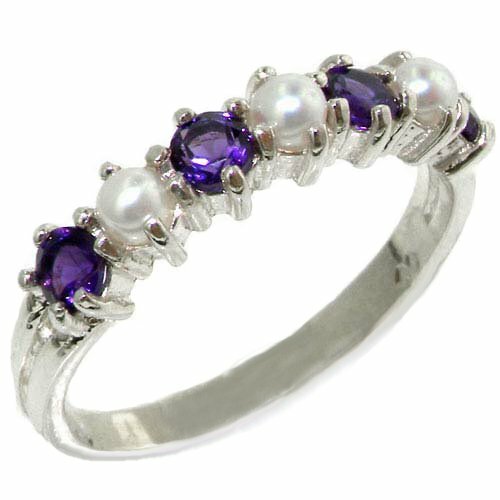 Channel set stones are not as prone to breaking loose as those in prong settings, which makes this a great choice for a wedding band. It's Okay if You Don't Want a Diamond Ring! When you're shopping for your perfect ring, there are a few things to keep in mind. Forget about the label "wedding ring" or engagement ring." If you go into a jewelry store or type those words into a search engine, the only rings that you will be shown are diamond rings. Be open to other possibilities. 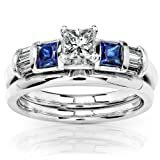 Browse rings in general. If you happen across a ring that speaks to you, then you've found your ring. It doesn't matter if your ring has a diamond, a ruby, or no stone at all. You should choose the ring that feels right for you. Nice article. I'm pinning this somewhere. Thank you. Maybe you'll find it one day. My mother lost her wedding ring after my father died. About two years later, my aunt found it in her dryer vent when they were replacing her old dryer. Stranger things have happened! Every one of these is beautiful. I used to wear my great-grandmother's diamond and sapphire wedding ring, until I lost it, unfortunately. This is also a great article just in time for Valentine's Day. I prefer the bands myself, too. Congrats on your engagement. Thank you! They are pretty!